Wisconsin Conference Bishop Hee-Soo Jung has announced the new district lines for the Wisconsin Conference. The Church will be switching from 8 (eight) to 5 (five) districts beginning in July 2015. Wisconsin Conference United Methodist Women will move to these districts beginning January of 2016. 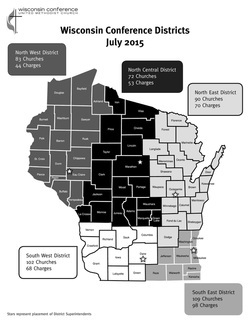 More information, maps and lists of churches for each district can be found on the Wisconsin Conference UMC website. Take a look. Where will you be in 2016 (North Central? North East? North West? South East or South West?). 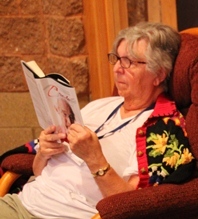 Visit the COMMUNICATIONS page and download the latest issue of Catch the Vision, newsletter of Wisconsin Conference United Methodist Women. The 2019 Reading Program List is Here! Supported by our Mission Giving dollars right here in the United States. Addresses of our regional missionaries. Send them a note or card to show you are keeping them in your prayers. CLICK HERE to read more about what this award is and why it was presented to Wisconsin United Methodist Women.